The new Rooftop Bags from Road Trip Kit are tough waterproof roof cargo bags, which quickly create loads of space for luggage whilst on the road. 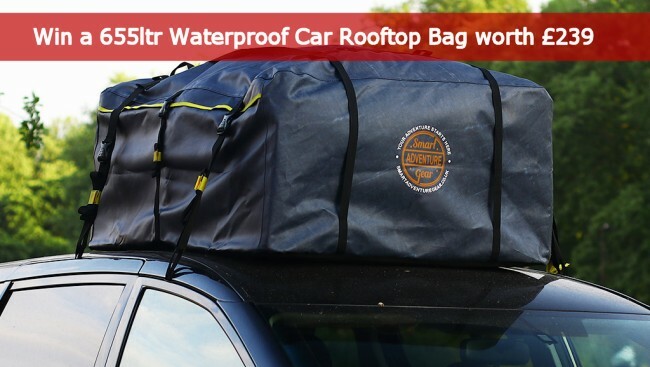 These car roof bags are lightweight and simple to use without the additional cost of a roofbox, roof racks or rails, and store away in a convenient carry bag the size of a pillow. 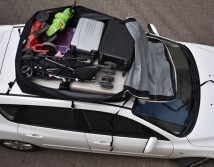 The new Road Trip Kit roof bags have been designed specifically for ease of use. They have what the manufacturer describes as a revolutionary new ‘Hook & Go’ system which is quick, simple and intuitive to fit – securely – to your car roof. They come with a padded foam base to protect your roof against scratches and other damage. They’re super light and easy to handle - to use the bag on your car roof there are two simple stages: (a) attach the grip hooks to your car door frames, and (b) strap the bag to the grip hooks. If you have side-rails on your roof you don’t even need hooks – they just strap straight on! When the bag is not in use simply remove, pack into the handy carry case and store in your car boot or a cupboard – saving you space even when not in use! They are fully waterproofed with PVC coatings layered on super tough 600x and 900x cross-weave polyester material (depending on model). and they can be locked shut via the rings on the rugged zippers. 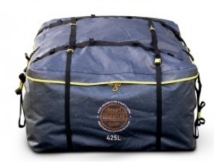 The Waterproof Rooftop bags are available in four sizes and can be purchased online direct from Road Trip Kit . There are four sizes, priced at £159.00 for a 425l bag, £199.00 for the 555l bag, £239.00 for a 655l bag and £349.00 for the 800l bag. This arrived well packaged and when we opened the box were please to see that the quality of the material did not disappoint. The bag comes folded in half with a strap to keep it small and this is perfect for storage when not in use. We opened out the bag and laid it out on the floor to look at the stitching and quality of fittings and found that the bag was very well made and even with lots of tugging and pulling it showed no signs of obvious weakness. The instructions were very clear and simple to follow and we after popping down the rubbers on the top of the doors, we put in the connecting hooks and re-attached the hooks. The bag then has straps that attach to the hooks. These fitted on easily and were simple to adjust and tighten. The zips are very sturdy and sewn in nicely to avoid any loose stitches that could cause problems. We had the 655 ltr for testing and the size of it is huge and large enough to carry the sleeping bags, pillows, clothes, etc. It is a quick process to put the bag up and take it down again and these are a great addition to the camping kit for those needing more space when travelling to and from site, or the local tip, etc. amazing would love to win this so much would be able to go away! So, despite finding the answer - I cannot enter. It's telling me it's the wrong answer. Try again with just the single digit in the answer box. Working for me.